« A List of 10 Common Questions Newly Vegan Athletes Ask: Part 2 of 2. A simple recipe for a comforting, hearty soup comes in very handy on those days when you’re pressed for time to cook dinner, and yet you’re in the mood for a warm, filling soup that tastes like you had to put a lot of effort into it. I tend to use lentils in soups quite often because they are filling and yet relatively quick-cooking – other kinds of legumes are usually high-maintenance. 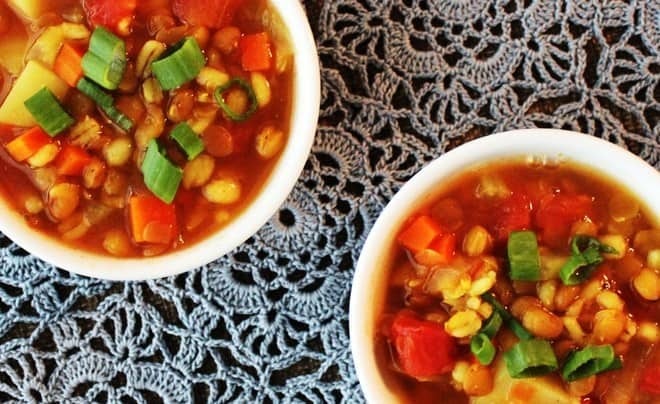 In the past, I’ve made similar soups with only lentils and some kind of grain, usually brown rice, farro or barley. However, adding tomatoes yields a much tastier broth in my opinion, and potatoes add to the heartiness of the soup. I used regular potatoes for this soup, but you can use cubed sweet potatoes as well. Regular white potatoes tend to take a while to cook through, so I add them at the same time as lentils and barley. Alternatively, you can microwave cubed and rinsed potatoes for 1:30 min on high and add them 10 min after you put lentils and barley into the soup. Microwaving potatoes softens them and helps them cook through quicker in your soups and stews. Recently I’ve been adding mushrooms to almost every warm meal I eat after I read that mushrooms have one of the highest nutrient-per-calorie density out of all foods. They turn out to be especially good for women’s health. Although the recipe for this soup doesn’t call for mushrooms, I added a couple of chopped-up raw baby portobellos to my bowl (not pictured). Don’t like raw mushrooms? You can quickly sautée them and then add to your serving of soup. And, of course, some chopped-up greens like scallions always go well with a hot bowl of soup! 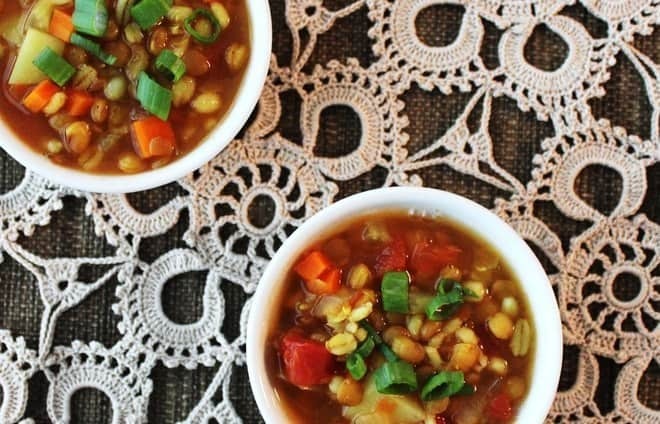 The combination of lentils and barley in this soup is very filling, and tomatoes add a nice zing to the flavor of the broth. White potatoes can be substituted for sweet potatoes. Add 2 Tbsp of water/broth to a heated large heavy-bottomed soup pot. When the liquid starts bubbling, add chopped onion, celery, and carrot along with minced garlic. Cook on medium heat for 5 min, stirring occasionally, until the vegetables are soft. Add more liquid if necessary to prevent the mixture sticking to the pot. In a separate pot, bring your broth or water to a boil, set aside. Add the rest of the ingredients (including spices, except for salt and pepper) to the soup pot, stir. Add boiling water/broth. Bring to a boil again, reduce the heat to medium-low, cover, and cook for 20-25 min, until potatoes are soft and lentils and barley are cooked through. Add salt and pepper to taste. When done, take the soup pot off the heat, let stand 10-15 min to cool off. Serve with a garnish of chopped scallions or other greens. See other soup recipes from the blog over here. Question for you: What’s your favorite soup during the cold time of the year? Tagged lentils, potatoes, soups, vegan, vegan dinner, vegan lunch, whole food plant based diet. Bookmark the permalink. I have FINALLY got my kids to eat tiny chopped mushrooms in soup! I think I will try this in the crockpot…. Yay for a win with your kids! What size can of tomatoes? is this a 15 oz or 28 oz? I am looking forward to trying this in the cold weather we are having now. It’s a 15 oz can, thanks for asking! 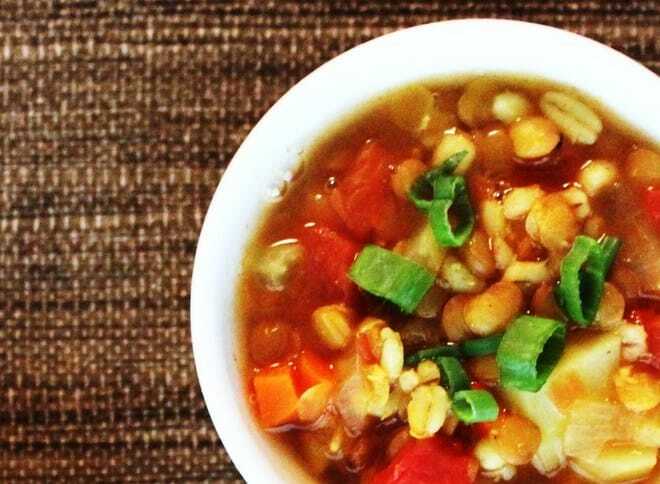 Thanks for this delicious soup .I increased the barley as I had no potatoes and it worked fine. I like how the barley and lentils make this a complete protein meal. Glad to hear that you liked this soup, Kay!